What’s one thing that all non-celebrity fashionistas have in common? A severe lack of money. This is a major issue for those of us who are in serious need of a wardrobe update. With summer around the corner, you want to make a statement with your clothes but instead, it seems all you have in your wardrobe are items that are grey, baggy and boring. For those of you who love the boho look, bat-wing tops are a great way to show off a little flesh in a tasteful way. Perfect for those summer days when you’re lounging at home or frolicking about in the countryside with a pint of cider in hand. To achieve the look, grab a pair of scissors and cut around the neck line of your top to make it wider. When you pop it back on, one side should fall just over your shoulder. Then, tuck the bottom of your top into a pair of fitted shorts to emphasise your waist. Understated, yet chic. There seems to be an unspoken rule that a girl can’t wear the same dress too many times. A great inconvenience to us non-Blair Waldorfs when we see the price tags that come with new dresses. However, with this well used trick no one need ever know you wore that dress before. With the addition of one great belt, a cunning dress disguise can easily be achieved. A belt will pull the dress in around your waist to emphasise your curves and it will spice up any bland dresses you have with a burst of summery colour. Waist cinching belts are an easy and cheap way to update your wardrobe, starting a just £3 on the high street. Nowthat is a bargain. Crop tops – they are absolutely everywhere at the moment. When a hint of sunshine peaks through the clouds, everyone is eager to show a wee strip of flesh. And why not? Your old t-shirt can be put to great use here. With your trusty scissors you can once again bring new life to your clothes by giving them a healthy chop. Summer means one thing: short shorts season is back. They’re a great item to have in the summer and you need never worry about flashing passers-by, something I find to be a frequent occurrence with skirts! But how does one obtain such shorts from a heap of old clothing? Well, by revamping a pair of old jeans. 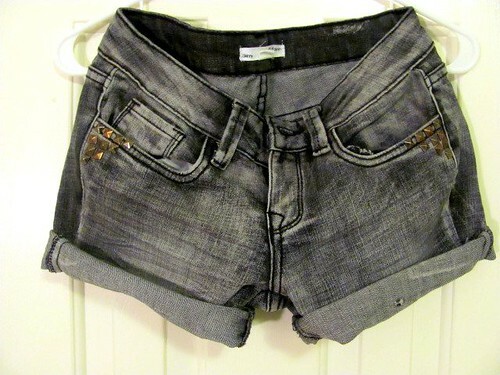 If you have a gander about any retail store, you’ll find many of the shorts on display have a washed out, grunge look. So why pay for a look that you can recreate yourself in a matter of seconds? Dig out your most comfy-but-ancient jeans that were headed for the bin and cut them to where you feel would be a comfortable length for you. Voila, custom made shorts without the price tag. If you don’t like the un-hemmed look, cut them a bit longer, roll the edge up a few times and press the fold into place with an iron. One can never be more heart-broken than when they finally accept their favourite pair of jeans are no more. They’re faded, they’re tired and they look damn awful. For many of us, the most pain-free option is to rapidly dispose of them before retreating to our bedroom to mourn their loss. But unlike many things, your jeans can be revived. How, I hear you ask? By investing in some dye. This doesn’t have to be the bog-standard blue; if you’re feeling really brave you can go for a more adventurous colour. Head down to your local craft store and pick out a colour that appeals to you, then get your dip-dye creativity juices going. Watch out for your hands though – bright green fingernails aren’t quite so desirable. With these little tricks you have the chance to wear something that is entirely original. Make your own fashion statement! Every customisation is an experiment, so old clothes are the perfect place to start. So go on and give it a go, who knows what masterpieces you’ll create? Have you got any other tricks? Maybe you’ve had a go at one of the above? Do show us your clothing creations, we’d love to see them! Grace is a student who has just finished her second year at university and is writing part-time for the GKBC Academy. She loves all things to do with fashion and has far too many clothes wedged into her wardrobe.